Native to the eastern half of the country and once known as Blue Sophora, it was brought into gardens by 1758. 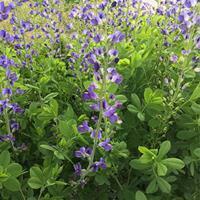 The pinnate leaves are blue-gray and look great all season long; the dark lavender blue spires of pea-like flowers add much to the overall lushness of the June garden. A low maintenance, long-lived plant that grows to become a small bush in time.A classic companion to peonies and roses. Rich salmon pink blooms are arrayed along the upright stems of this rare heirloom. Beautiful with Shirley poppies, California poppies and ‘Blue Angel’ German catchfly. A great cut flower, it blooms longest in moderate summer areas with cool nights, elsewhere it blooms spring to summer. Provide regular to fertile very well-drained soils. PPAF. This cultivar of native penstemon has non-fading deep wine red foliage and a multitude of rosy lavender narrow belllike blooms held on sturdy upright stems. Bred in Nebraska, it shrugs off heat, humidity and severe winter cold and blooms like mad for months in late spring into summer. Provide very well-drained soils. This native to Texas and New Mexico was described as a 'favorite annual' in 1840! Pure white flowers 4-5" across combine well with the gray-green color of the prickly stems and leaves. The masses of blooms look beautiful with California poppies. 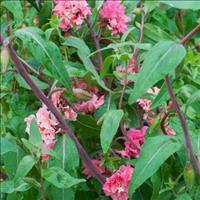 Thrives in hot, dry, sandy soils. Blooms early to midsummer; cut back after the first flush of bloom for another show. Bees love it! Self sows.